I/O Modules for Smart REG CPU With the Smart REG CPU these modules offer an optimal flexibility with only a little installation effort. Over the H-BUS the modules are connected with the REG CPU. This connection can be done via H-BUS connectors or as an external module with the help of enclosed clips. 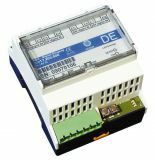 This power supply is a high quality and short circuit protected power supply for the modules of Intellihome IHSI. Weather Stations IHSI package allows the extension of the basic package IHSI. This package measures the outside temperature, brightness, wind speed and detects rain. The Multisensor - Collector is used to connect up to 8 multisensors (MS4/MS8/MS16/MS24) to a Smart REG or Multimedia -CPU. The connection is done by a 4-wire line or the H-BUS. Simple wiring of the multisensors. This software is used for creating and editing INTELLIHOME projects. The Homebuilder supports you working on projects from beginning until the end. With the Homebuilder software you can do planning, offer, allocation scheme, view status and parameter setting of any INTELLIHOME component. You can work online directly connected to your INTELLIHOME system and you can even work offline and go online later and update all the work you have done.